Since Tone Madison launched in 2014, readers have enjoyed some of the best local culture journalism in Wisconsin. In-depth interviews with local musicians and artists, especially ones who might otherwise fly under the radar. Previews of compelling shows and film screenings. Stories that dig into the hairy issues surrounding local arts and culture. Opinions that stimulate and occasionally sting. Providing the high-quality coverage our readers deserve takes independence, commitment, and persistence. It also takes support from a generous group of readers we call Tone Madison Sustainers who invest in our work every month. As Tone Madison continues to grow, we need more engaged, thoughtful Madisonians to become Sustainers. Not only will your gift ensure that Tone Madison is able to continue operating on a more sustainable basis, but you can help us launch new and innovative projects that dig deeper into Madison’s arts scene. You'll also enjoy member benefits like occasional extra content and discounted admission to our events, including the February 9 show we're hosting at Communication. During this February fundraising drive—we picked the shortest month of the year—our goal is for 150 of our readers to begin donating for the first time. Forming a new partnership with Communication Madison, which gives us the chance to grow from a scrappy operation with freelance contributors and volunteer editors to a still-scrappy but much more stable, nonprofit operation that employs some full- and part-time staff. Receiving a $500 grant from Dane Arts to support a short documentary series we've been planning, marking the first investment from a local foundation. We are thrilled about these developments, but we need to at least triple that support in order to make the progress a reality. That’s where you come in. In return for your support, we'll dig in even deeper to spotlight the people who make Madison interesting and say things that need to be said. We'll also send you our brand-new Tone Madison logo shirt, designed by Madison-based artist Shelby Floyd and printed by False Floor Creative on Madison's east side. (Special thanks to Tone Madison's own Katie Hutchinson for modeling the shirts and Jennifer Bastian for taking the photos you see in this post.) Shirts are available in blue and red, and in unisex sizes up to 2XL. Just let us know the size and color you'd like when you're making your secure donation through PayPal. 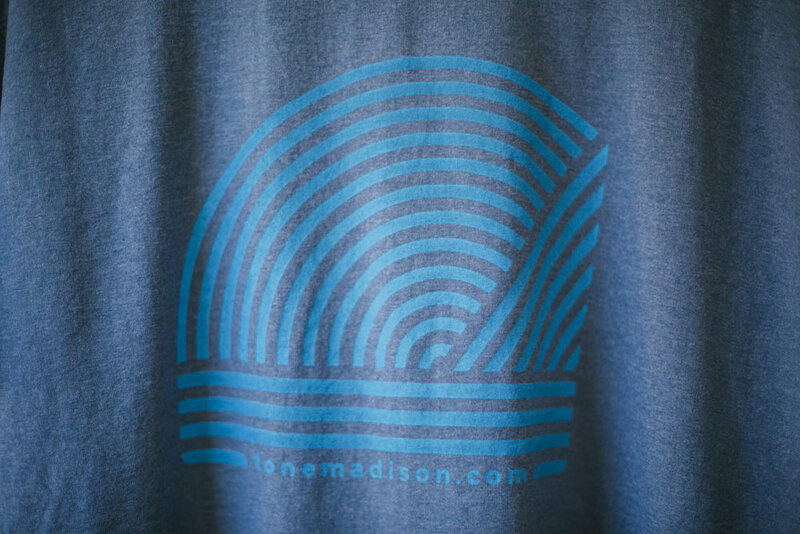 Our new Tone Madison logo shirts aren't for sale in our web store—the only way to get one is to become a Tone Madison Sustainer at the $5/month level or higher, or by making a one-time donation of $75 or more. Thanks to our partnership with Communication Madison, your contribution is now tax-deductible. Monthly recurring donations come with other benefits, detailed at tonemadison.com/donate. If you're not in a position to chip in financially, you can help us out quite a bit by subscribing to our email newsletter and telling your friends about us. If you're interested in a business sponsorship or a larger gift, here's more information about that. Thanks for your support, and thanks for reading and listening. We're excited to keep on building this thing for you—and with you.